Learn some interesting information about Peru while enjoying a range of fun facts and trivia that's perfect for kids! Read about the Peruvian Amazon, Peruvian animals, the currency, language, capital city, Inca Empire and much more. The official name of Peru is the Republic of Peru. 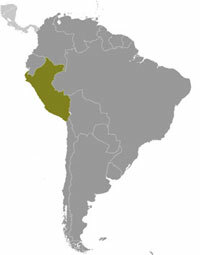 Peru contains the second largest segment of the Amazon rainforest after Brazil. The Peruvian Amazon covers 60% of the country. The large biologically diverse area of Amazon in Peru is home to the most bird species in the world, the third largest number of mammals and a very high number of species of butterflies and orchids. Peru shares borders with Ecuador, Colombia, Brazil, Chile and Bolivia. Modern day Peru has been home to many ancient civilizations, the largest and wealthiest of these was the Incas who's empire ruled for over 100 years until the Spanish arrived in the 16th century. Just under 30 million people live in Peru (29,849,303) as of July 2013. The capital city of Peru is Lima which is home to more than a quarter of Peru's population. The Inca Empire was centred around highlands of the Andes mountain range and the civilization's capital city Cusco and mountain top citadel Machu Picchu are popular with visiting tourist to this day. Spanish is the main language in Peru although many also speak the Inca language Quechua. The third official language is Aymara. The Huascarán National Park in Peru has 27 peaks over 6000 m (19,685 ft) above sea level. The highest of these is El Huascarán at 6768 m (22,204 ft). Peru celebrates its Independence from the Spanish Empire on the 28th and 29th of July. It is known as 'Fiestas Patrias' which means 'Patriotic Holidays' or 'National Holidays' in Spanish. The potato is native to the southern area of what is now modern day Peru. While Peru remains a poor country it is one of the richest in terms of natural resources. It is one of the world's top producers of gold, silver, copper, lead, iron and zinc and also has reserves of oil and natural gas. Cuy (Guinea pig) is a traditional meat used in Peruvian meals, it is estimated that 65 million guinea pigs are consumed in the country each year. For more information, check out maps of Peru or take a closer look at the Peruvian flag.